The outline for this workshop is simple. You need to bring your desire to connect with your drum (or your curiosity) and a chosen rock that will fit in your hand comfortably to hold for any period of time. It will take approximately 4 hours to make your drum. Wear comfortable clothing that you don’t mind getting down and dirty if needed. We start with a pre-constructed frame, deer hides, and a bucket of walnut stain. First you choose your frame, lay out the hides and pause to take a few moments to connect to the spirit of this medium… the deer, the wood, the rock and the stain… all are natural and all carry their own spirit! 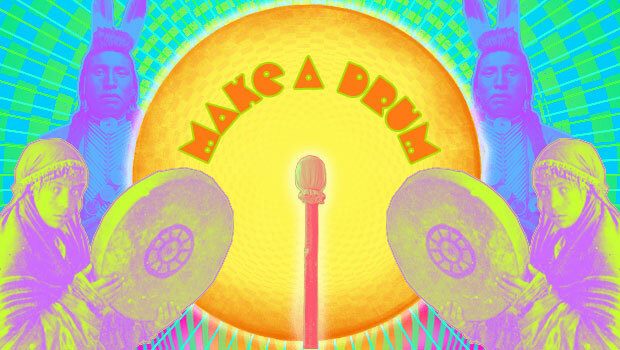 After cutting out the drum circles, Wayne will take you one-step-at-a-time through the entire process. As I started making drums, I was especially interested in the vibration of rawhide and the sound it makes. Once I was able to consistently achieve the quality sound and felling I was looking for, assign antlers, wood, stone, and lacing variations made the drums more decorative and visually pleasing. 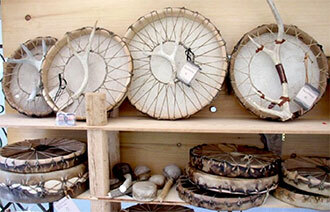 The healing properties of a drum are found in the elements that make it: wood and animal hide. Making personal frame drums is a journey that is individually and spiritually meaningful. 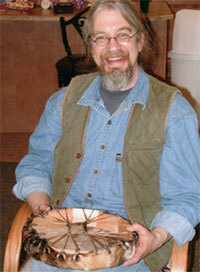 Teaching drum making classes involves storytelling and introspection. The drum symbolizes the heartbeat of life, the heartbeat of community. It is not simply an art form, but a tool for cleansing, centering and focusing one’s intentions for health and happiness.